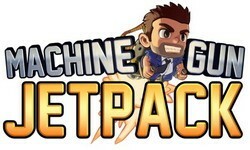 Halfbrick which is the developer of Fruit Ninja, Monster Dash and Age of Zombies has announced a new game for summer 2011 – Machine Gun Jetpack (MGJP). 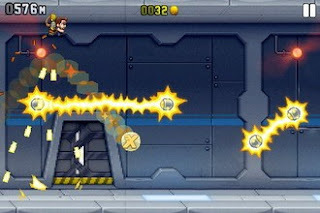 MGJP is a simple, one-button experience where players control the height of Barry as he rockets through the air, spraying bullets towards the ground. Obstacles will appear including electricity fields, moving lasers and even high-powered missiles in an attempt to stop your reign of action. Along the way, players can grab vehicle pickups including Gravity Suit Barry, the classic Badass Hog, a giant mech suit called Lil’ Stomper, and the bizarrely awesome Crazy Freaking Teleporter. These are just a sample of the range that will be available upon the release of MGJP. To top everything off, coins can be collected to spend in-game on various cosmetic and functional upgrades. Want a top-hat? Sure. Double shields? Bam. A jetpack that looks like a shark’s jaws and shoots bullet teeth? Indeed so. The range of items to purchase in the shop will be massive, with additional content being added via ongoing updates. MGJP will be released in early summer 2011 as a universal iPhone/iPad game. You can keep track of all the upcoming MGJP news via www.halfbrick.com. 0 comments on "Machine Gun Jetpack (MGJP) new game from the developer of Fruit Ninjain summer 2011"